STANFIELD - The Heppner Mustangs and Elgin Huskies played a great five set match on Saturday afternoon at the BMC 4-Way volleyball tounament. Heppner ultimately took the match 3-2 by winning the first to 15 fifth game. 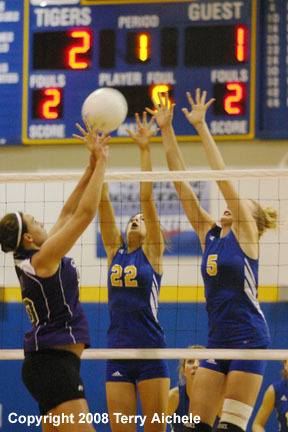 The first game of the match started about a half hour after Elgin's win over Stanfield. Heppner came out taking the early 5-1 lead. Elgin battled back to tie it at 6-6. Elgin took the lead at 9-8 and didn't look back as they took the lead in the second half of the game with the strong serves of Tara Ludwig, Chantele Malone and Kelsey Fincher. The game ended with Elgin winning 25-20. Heppner took control of the game early and dominated from the 13-10 point through the 25-13 final. The Mustangs seemed to come alive with great play at the net by Lenka Dobosova. Dobosova's powerful offensive work at the net included spikes that seemed to break the sound barrier. The third game was a close one. The lead was being exchanged regularly with the teams at 22-22 close to the end of the game. Strong team work and some strong serves by Brandi Campbell and Lauren Sauers closed out the set with a win for Elgin 25-23. 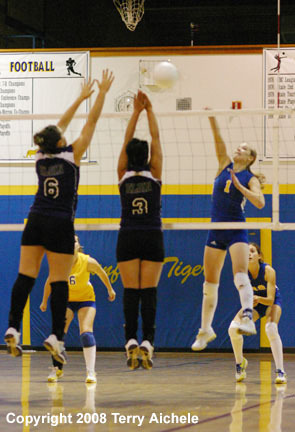 The fourth game was controlled by the Mustangs on several levels. First Dobosova came alive with strong offensive net play and Taighler Dougherty had two long runs of serve including an ace. Heppner took the game 25-12 forcing a tie-breaking game five. The first to fifteen fifth game was close with the teams tied 6-6 just before the midpoint. That's when Lenka Dobosova served to take the Mustangs to a 10-6 lead. Big time kills from Dobosova and Sheilyn Peck were momentum makers for the Mustangs. The Mustangs took the fifth game 15-9. 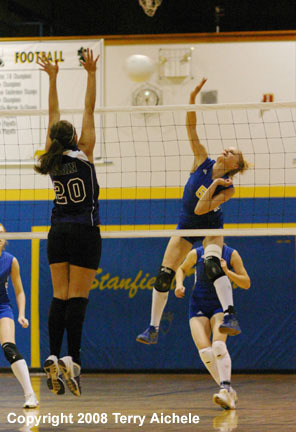 LEFT - Tara Ludwig of Elgin goes up to defend against a spike by Kelsi Putnam of Heppner. RIGHT - Lenka Dobosova leaps high with the windup for one of her powerful spikes against Tara Ludwig. LEFT - Lenka Dobosova with another powerful spike. 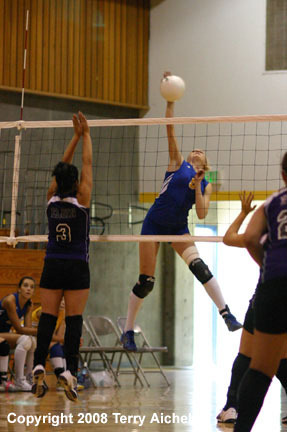 RIGHT - Sherilyn Peck of Heppner tips the ball over the net. 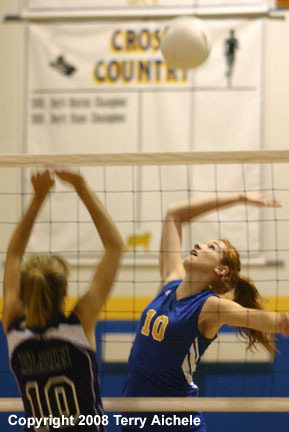 LEFT - Jade Silver, of Elgin, in the far court blocks a spike by Heppner's Taighler Dougherty. RIGHT - Elgin's Susan Jones goes to one knee to bump a serve, backing her is Beija Robbins the libero. 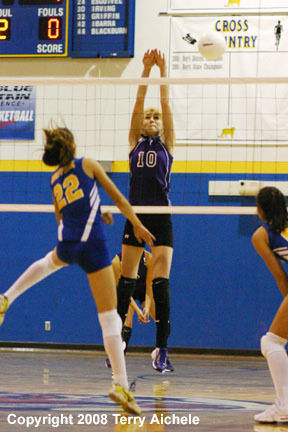 LEFT - Jade Silver of Elgin goes up for a defensive block. 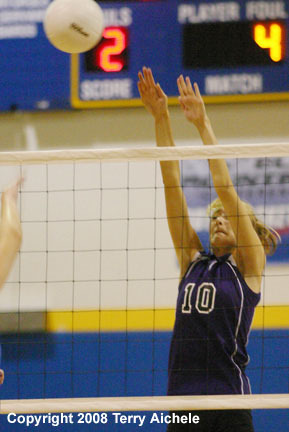 RIGHT - Elgin's Tara Ludwig spikes the ball. LEFT - Taighler Dougherty and Lenka Dobosova of Heppner attempt to block a shot by Elgin. 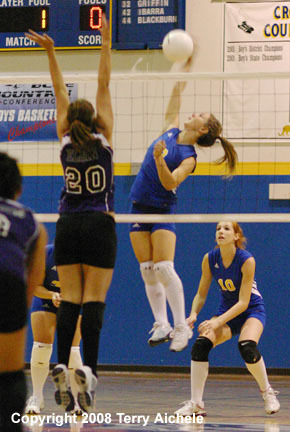 RIGHT - Heppner's Lenka Dobosova crushes a kill shot. 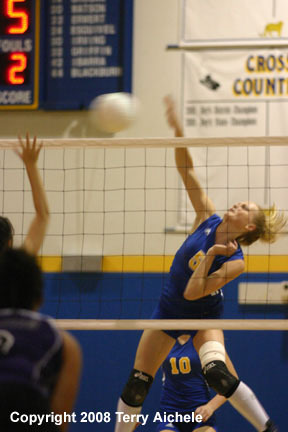 Heppner's JoAnna Patton prepares to hit a spike.